A monument reportedly raised in the Alps in honor of a faithful guide who perished while ascending a peak to rescue a stranded tourist. It read “He died climbing!” Believe it or not, that is what we all want to be said of us when our time on this earth is over. None of us want to burn out before we breathe our last breath and so each day, each week, each year we have this inner, inspirational dissatisfaction. Inspirational dissatisfaction is a restlessness of heart that comes from recognizing the distance between where you are and where you want to be. Without it we make a truce with the status quo and quit struggling against our shortcomings. With it we have the motivation to make the changes necessary to be all God wants us to be. Ask yourself right now, “Am I where I want to be or had planned to be in ministry at this point in my life?” If your answer is no that is what inspirational dissatisfaction is all about. It springs forth from self-awareness. This begs the question, “How do I go about reaching the point in ministry I desire?” How can I maximize my ministry and fulfill the will of God for my life before I leave this earth? Thomas Goodman (1961/1994) identifies four steps to determining, implementing, and maximizing your ministry. Let me give them to you upfront. First, create what is called “Your Ministry Manifesto.” Second, conduct a personal checkup. Third, Set Goals for Personal Improvement. Fourth, Set Action Plans. Here goes. Let’s talk about Identify: What happens in the identify stage? Vance Havner reportedly said, “The devil will let a preacher prepare a sermon if it will keep him from preparing himself (Goodman, 1961/1994, p.2).” This training is aimed to help you commit to a personal development plan that is in concert with your ministry goals. In this stage, the identify stage, you identify the message God gave you when God called you to ministry. No message, no call. Everyone in the scripture God called, God gave them a message, God developed them through tests and trials to embody the message he gave them. For example, God told Hosea to marry a harlot to embody the message that God was committed to his people although they were committing harlotry with other gods. Robert Bellah in his book “Habits of the Heart,” writes, “For most of us, it is easier to think about how to get what we want than to know what exactly we should want” (Goodman, 1961/1994, p.7). Whether you admit it or not, you must understand that Jesus called you to a specific ministry, a specific message and the embryo of this calling is contained in your initial sermon. Every sermon you will ever preach is contained in that initial message and you need to go back, take a look at it and dissect that message for key themes, concerns, and issues that Christ elevated in your heart on that initial outing. For those who are not called to preach, you have to take the time to examine your passion. Locate the zeal in your heart; what fires you up; what matters to you. Herein lies the key to your calling and the zeal and passion in your spirit is where God resonates most within you. So start with that zeal and that passion. Jesus had such a zeal, in John 2:13-17 he demonstrates how that zeal can cause action in line with your zeal. This is one of the times that mild mannered Clark Kent turned into superman. Jesus turned the tables upside down and actually got a whip and ran priests engaged in selling sacrifices out of the temple. He was lit up about the fact that he believed “God’s house should be a house of prayer for all people” and that zeal led him to act. Preaching messages that don’t set your soul on fire simply indicates that you are preaching someone else’s message. It may become yours one day, but that day has not arrived if that message does not resonate within your spirit. That is why it is critical for you to dissect your initial sermon to find those topics that light your soul on fire. And the key is you have to be intentional about it; you can’t wait for it to develop, you have to find it. Intentional Ministry is ministry aimed at developing the life work God has called you to so you can stay in your lane and maximize your ministry. Think about a person who has impressed you. Why do you admire that person? Now think about a person who negatively impresses you. What is it about that person that has disappointed you? What plan have you developed to ensure you walk in the direction of the person who impressed you positively rather than the one who impressed you negatively? Again, if you do not act intentionally, you will miss valuable opportunities to maximize your ministry. You have heard it said, “Without a vision, the people perish.” Well without a personal vision, you will perish. And this word perish means you will fade away, burnout, not complete the ministry or life God intended when he called you. When you serve without a sense of purpose, you are vulnerable to self-doubt, squandered resources, and hostile division. A splinter in your soul will negatively impact your preaching and your service. Do what you do on purpose and you’ll always be empowered, energized, and engaged. Having said that once you identify your message, you need to develop a personal ministry manifesto, a public declaration of intent, to guide you over the course of your ministry. A ministry manifesto, is your “defiant shout into the faces of those who oppose your ministry. This manifesto gives you a framework for ministry, prevention against burnout, and a framework for better stewardship of your time. It also motivates you and allows you to engage in meaningful productivity as well as provide a renewed sense of the dignity of your calling. A personal ministry manifesto, allows you to define your objectives in ministry which gives you ample justification when talking with bishops, elders, and others involved in your ministry. It enables you to present your priorities, your message to those seeking your services, or those trying to set your agenda for you. Imagine the bishop for those of you on the call in ministry, calling you saying he or she wants to appoint you to another church. Intelligently, respectfully you ask the bishop what that church needs and what the bishop sees as the priorities for helping that church go to the next level. Well, once the bishop explains his goals for that church; your knowledge or your message, your gifts, and graces will allow you to either agree that you would be a fit for that church or allow you to convince the bishop that you would not be a good fit based on who you are and your message. Listen, “when others try to set our agenda, we must be able to explain our objectives to them” (Goodman, 1961/1994, p.15). Finally, to develop your ministry manifesto you need to prepare a written statement of your objectives (identify), examine ways you can fulfill your objectives (strategize), set goals in relation to your statements of objectives (strategize), and make a plan of action for each goal that you set (act). I would love to coach you in this process and help you develop your ministry manifesto as well as develop your plans and strategies to maximize your ministry in the near future. You can schedule me for one on one coaching in this process or you can book me to come to your church and provide training in this area for you and your members. This entry was posted in Leadership Development and tagged goals, leadership development, personal growth, planning, strategy, vision on November 22, 2013 by Earl J. Griffin, Sr..
What is the difference between those who lead and those who don’t – the ability to make and sustain quality decisions in times of adversity. Crossroads normally result from adversity. 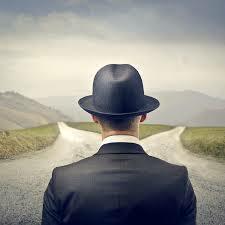 And when standing at the crossroads of life, approaching a two-way intersection, choice becomes inevitable. When some people experience setbacks, depression and despondency seem to overwhelm them and in fact, presents itself as reasonable responses. However defining circumstances also require a defining choice. Depression and despondency causes some people to fade into obscurity. But not leaders; leaders have a peculiar mindset! Leaders know that the adversity contains valuable lessons, seeds of wisdom waiting to be discovered. John Maxwell says that in life, “Sometimes you win, sometimes you learn.” Leaders choose to take “the road less traveled by” that of becoming cognizant of lessons learned and applying such lessons to the next effort. Thus leaders, when faced with adversity find a way to recover, regroup, and recharge. Recover. Setbacks are delays, detours, but often not denial. Incidents may occur which delay the fulfillment of our dreams without killing the dream. Leaders can recover from setbacks by exercising faith, patience, and tenacity which leads them through such predicaments. Regroup. Sometimes, setbacks can so impact our spirit until we need a time to regroup and compose ourselves. In these moments, we need to get in touch with our purpose, our vision, our dream. We need to ask ourselves is it worth it? One wintry night in January 1956, Dr. Martin Luther King Jr. was unable to sleep. It had been one month since the start of the Montgomery Bus Boycott; threats on his life and that of his family were constant. Dr. King relates in The Autobiography of Martin Luther King, Jr. (Carson 1998) that he settled in to bed late after a strenuous day. Coretta had already fallen asleep and just at as he was about to doze off the telephone rang. An angry voice said, “…., we’ve taken all we want from you; and before next week you’ll be sorry you ever came to Montgomery.” Dr. King said, “I hung up, but I couldn’t sleep. It seemed that all of my fears had come down on me at once. I had reached the saturation point.” Dr. King had heard these things before, but for some reason that night it got to him. He turned over and tried to go to sleep, but he couldn’t sleep. He was frustrated, bewildered, so he got up and began to walk the floor. Finally, he went to the kitchen and got a pot of coffee. He was ready to give up. With his cup of coffee sitting untouched before him, he tried to think of a way to move out of the picture without appearing a coward. He sat there and thought about his beautiful little daughter who had just been born. He would come in night after night and see that little gentle smile. He started thinking about a dedicated and loyal wife, who was over there asleep. Coretta could be taken from him, or he could be taken from her. Dr. King said he had reached the point where he couldn’t take it any longer. He was weak. It was at that moment that he heard a voice which said, “You can’t call on Daddy now; you can’t even call mama. You’ve got to call on that something in that person that your daddy used to tell you about, that power that can make a way out of know way.” With his head in his hands, he bowed over the kitchen table and prayed aloud: “Lord, I’m down here trying to do what is right. I think I’m right. I am here taking a stand for what I believe is right. But Lord, I must confess that I am weak now, I’m faltering. I’m losing my courage. Now, I am afraid. And I can’t let the people see me like this because if they see me weak and losing my courage, they will begin to get weak. The people are looking to me for leadership, and if I stand up for them without strength and courage, they too will falter. I am at the end of my powers. I have nothing left. I’ve come to the point where I can’t face it alone. Once the prayer was done, Dr. King said he could hear the quiet assurance of an inner voice saying “Martin Luther, stand up for righteousness. Stand up for justice. Stand up for truth. And lo, I will be with you even until the end of the world.” Dr. King said, “At that moment I experienced the presence of the divine as I had never experienced him before. Almost at once my fears began to go. My uncertainty disappeared. I was ready to face anything. This was Dr. King’s defining moment. This moment solidified Dr. King as the leader of the civil rights movement. When you experience setbacks, take some time to meditate and critically revisit your dream. The strength of knowing your dream is valid and based on truth is powerful enough for you to regroup and move forward. Recharge. Think it through then push the body through. Once you have accepted the outcome of the setback, you can confidently strategize to regain the advantage. Leaders look realistically at where they are now and then visualize what actions they must take to regain their peak performance. The distance between adversity and success can be forged as you maintain a healthy perspective of discontent. Recover, regroup, and then recharge. When you recharge you visualize yourself working through the necessary steps to regain your position and then to initiate those actions that will take you further along your envisioned goals. Announce your plans to others in your field and on your team and ensure to set new deadlines for achieving these goals. Motivate yourself and others using genuine optimism and faith that you will overcome this adversity. Surround yourself with others who have either made this stride or are undergoing the same process and collaborate with them. In other words, develop a winning team and reestablish yourself as a winner in your field. This entry was posted in Leadership Development and tagged adversity, failure, obstacles, opportunity, setbacks, victory on November 20, 2013 by Earl J. Griffin, Sr..